Airports are stressful places. From check-in lines to waiting for takeoff and picking up your luggage when you land, nothing is quick or easy about flying. But, all that’s a walk in the park when you compare it to traveling with kids. Waiting in long lines and sitting in cramped spaces can really make little ones cranky! Fortunately, there are a few things you can do to make flying less stressful for you and your children. Every parent’s worst airport nightmare is the delay or cancellation. The only thing that makes it worse is sitting on the phone while you wait for your next flight trying to get some kind of reimbursement. Providers like Get Service eliminate the wait and the hassle. This program files all the claims for you so you don’t have to. That leaves you with plenty of time to hang out with the kids and check out the shops in the airport instead of sitting on hold or waiting in line. 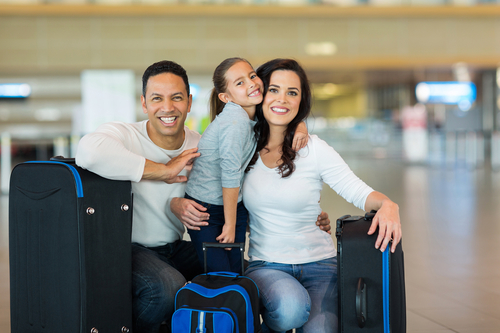 Many families make the mistake of taking whichever flight is available at the time, but it really pays off to focus in on flight times that would work best for your family. There are many reasons why it’s a good idea to fly really early, but one of the best reasons is that your kids will be drowsy. If you have to get up at 4:00am to drive to the airport, they may be cranky on the way, but they’ll pass out as soon as you board. Late flights are a good idea for the same reason. If it’s past your child’s bedtime, they’ll sleep on the plane instead of whining. Planes and airports are notorious for temperature changes, and that doesn’t even include the temperature change when you land. That’s why it’s important to dress children in layers. The back of the plane is a good place for children, but it isn’t the only seating consideration. You should keep your child out of aisle seats. A lot of traffic can walk back and forth, including the cart that the stewardess uses, and it’s easy for tiny hands to get in the way. Instead, seat your child in an interior seat. It’s even better if you can seat them next to the window so they can watch the change in scenery. Flying will always be stressful with children, but it doesn’t have to be so stressful that you swear off airports until they turn 18. With these tips, you can make sure that everyone in your family is as comfortable as possible.